In this interactive online math test, young kids will have multiple opportunities to add two numbers to make sums of 10 or less. With a variety of number combinations such as 4+3, 2+8, etc., this test has both multiple choice and drag-and-drop questions. Students can use mental math, count their fingers, or count images or pictures to find the answers to different addition problems. 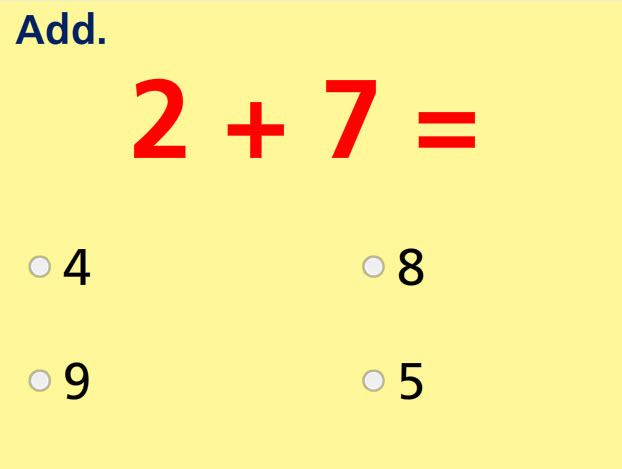 This online quiz is a fun way for kids to practice addition sums up to 10. It is designed to help students master their math facts. Return from this Add Two Numbers- Sums to 10 Math Test to the Elementary Math Tests , Kindergarten Math Tests webpage, or to Math Tests.